Pretty much a self-proclaimed title, but I do meal prep like a boss and I’m damn proud of it. 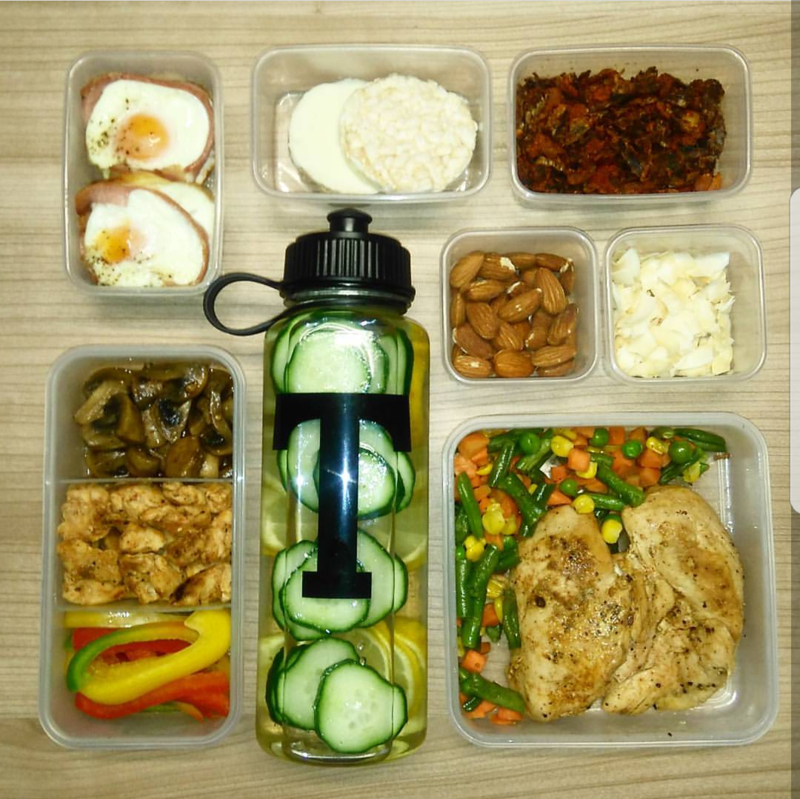 A year ago, I pretty much sucked when it came to planning my meals and basically ate on the fly. The nature of my job didn’t help much as I was always travelling, constantly finding myself in a car or an aircraft. I ate whatever I could get my hands on, which was mostly unhealthy food. I also over ate because l had no plan and didn’t track what l ate. 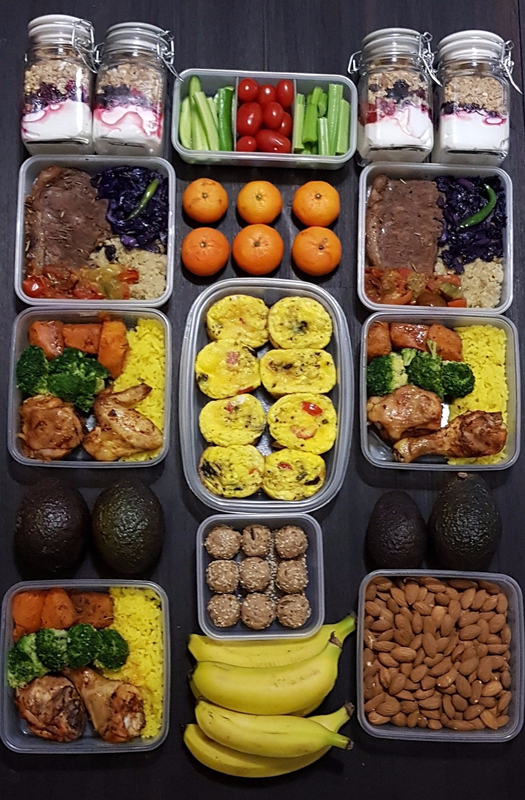 Six months into this journey, I had read about meal prepping and thought that I should give it a bash. Now I can honestly say that I love my Sunday afternoon meal preps. It’s my day to reassess, refocus and set new goals for the week ahead. By the end of my two hours of meal prepping, I’m left feeling focused and ready to smash out another week of goals. Meal preparation, better known as meal prep can mean different things to different people, so it’s a matter of figuring out what best serves you and makes your life easier. I meal prep for four meals per day for five days. Dinners are spontaneous as I need some spontaneity in my life. Some people however, just prep snacks or lunches. 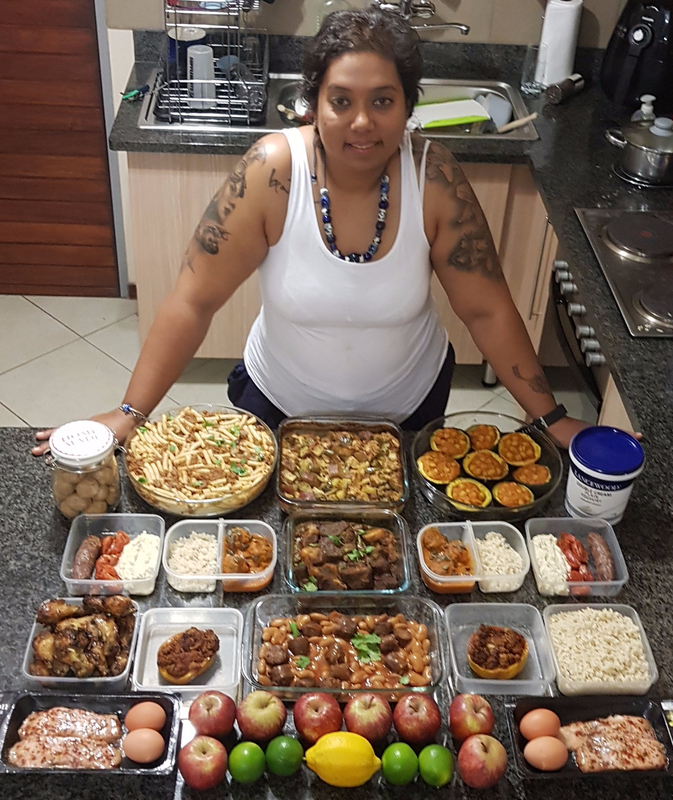 Irrespective of your type of meal prep, you will find that its saves you money and time, keeps you motivated and helps you achieve those goals. Benjamin Franklin supposedly once said, “Failing to plan is planning to fail,”. It’s a rather harsh adage, but there is some truth in it. Planning is a far easier way to achieve your goals. It gives you the edge and serves as a constant reminder of what you have set out to achieve. Set some time aside to plan your meals according to your dietary requirements. Thereafter, make a grocery list so that you are prepared when hitting the shops. Make a point to ensure your meals are balanced and healthy, so that you load your body with plenty of yummy and wholesome goodness. So you have now created your meal plan and finalised your grocery list, so now its time to check if you have your storage game on. I went through my cupboard to check what containers I had, but opted to buy a new set. This made stacking in the fridge much easier. Make sure your containers are compact; of a good quality and are airtight to keep in the freshness. I prefer smaller containers as I eat small portions throughout the day. Mason jars are great for storing breakfast parfaits, salads and snacks like power balls or nuts. I also use the snack size zip-lock bags to portion out my almonds and biltong for instance. Glass Pyrex dishes with lids are a better option if you are prepping bigger meals. I use different equipment when cooking to speed up and make my meal process a lot more efficient. My air-fryer is probably the most used item in my kitchen, but I also use a stick blender, spiralizer and julienne strip grater. A kitchen scale and measuring cups are a must if you are super serious about meal prepping. Slow cookers, pressure cookers, rice cookers, and steamers can also be helpful during a meal prep, but are not items I use. 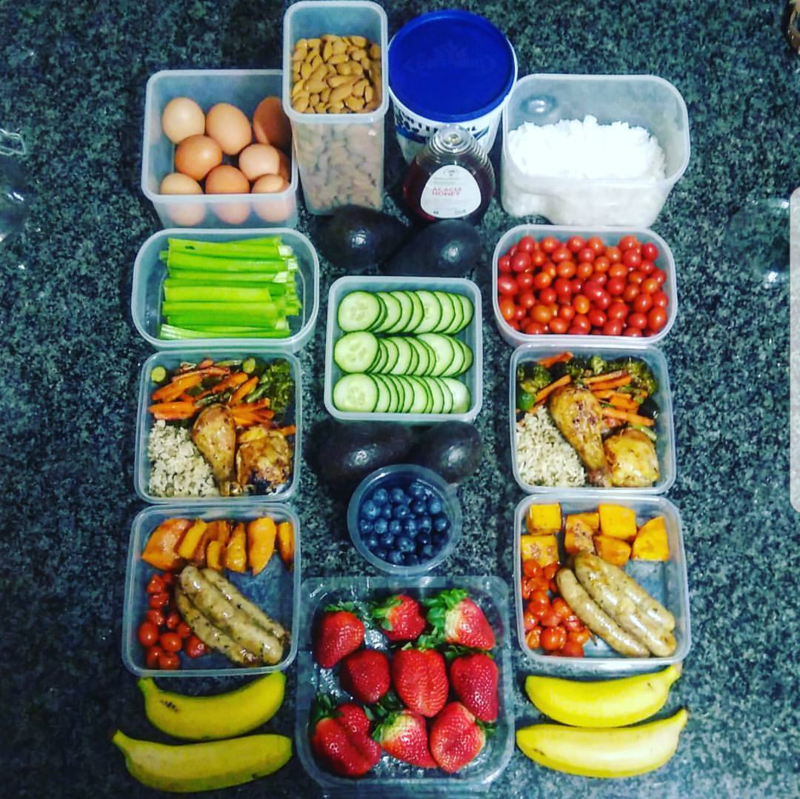 I prefer keeping things simple and aim to complete my full meal prep within 2 hours maximum. A large oven tray is also extremely handy. So now that you are organised and prepared, its time to hit the shops to get the groceries you need for your meal prep. Don’t leave home without your grocery list, as this will keep you on track and curb the impulsive and unnecessary shopping. Stock up on fresh and organic items where possible. Keep an eye out for healthy alternatives for carbs and sugar. Just a tip – don’t go shopping on an empty tummy. I’m a creature of habit and thrive on routine. It’s also the key to successful meal prepping and goal smashing. I personally spend my Sunday afternoons cooking up a storm to prep my meals and snacks for the week ahead. Choose a day that best suits your lifestyle, so that you can establish a routine. Yogurt, berries and chia seeds. Despite popular belief, healthy eating doesn’t have to be expensive if you plan correctly. Buy things in bulk and peel, chop and store in the freezer. By planning ahead and being prepared you will know exactly what you need to buy. No more shopping for unnecessary things. No more spur of the moment trips to the canteen at work or the nearest garage shop. The best part is that you will no longer be throwing food away because it spoils before you get to use it. When you meal prep, you make use of your ingredients for the week, and it is highly unlikely that you will have any leftovers. I can’t emphasise enough how much time is saved with meal prepping. Granted, I spend a few hours to plan and prep all my meals. I however, don’t spend time deciding what to cook or heading out to the shops on a daily basis. There’s no time spent cooking dinner after a busy day at the office. Instead your time will be your own is my own and I can hit the gym and spend quality time with my family. Once you know what meals you will be eating for the week and have compiled that grocery list, shopping will be a walk in the park. No more shopping for unnecessary items. Definitely no more finding yourself in the chips and sweets aisles, being tempted to buy unhealthy goodies. Meal prepping teaches you self-control and discipline. You put in the effort to ensure you have balanced meals. As a result you will better manage your portion sizes and calorie intake. If you want to lose weight and consume the right amount of nutrients, portion control is exceptionally important. You can still treat yourself from time to time, but then it will be on your terms. Variety is most certainly the spice of life and if you are able to put thought into your meals ahead of time, it will become easy to choose from several different food group. Variety will help you stay motivated and on track. There are no limitations and this will spur on your creativity. So don’t forget to change it up and keeps things fresh and exciting. I loved this post. I’ve always tried to do some meal prepping but I find it difficult for a bigger family. This is sure good tips which I’m definitely going to follow. this is really handy. Thank you for the share. I definitely plan to be more proactive in my meal prep.